The gram-negatives bacteria classified into the genus Pseudomonas comprise a great variety of microorganisms inhabiting diverse ecological niches. These bacteria can be found as human pathogens (1), as free-living organisms in water and soil, and, mainly, associated to the plant rhizosphere and endosphere (2). Thus, showing versatile lifestyles and varied metabolisms, which help to respond well to a wide variety of biotic and abiotic factors (3). Particularly, P. fluorescens strains are common inhabitants of the plant rhizosphere and some strains actively colonize the internal plant tissues, living as endophytes (4), where they play diverse beneficial activities. P. fluorescens strains also exhibit different mechanisms, either direct or indirect, that promote plant growth and/or biological control against fungi and other pathogens (5). The main mechanisms attributed for biocontrol include: synthesis of secondary metabolites, such as 2,4-diacetylphloroglucinol (2,4-DAPG), hydrogen cyanide (HCN), pyoluteorin, pyrrolnitrin, phenazines, cyclic lipopeptides (CLP) and siderophores (6); production of phytohormones, such as auxins, cytokinins and gibberellins; as well as nutrient solubilization traits (nitrogen, phosphorous, iron), which directly favors plant growth and health (7). Few complete genomic sequence comparisons of Pseudomonas species have been previously reported (8-10). Such comparisons have been relevant to discover important genomic differences among species or strains. For example, Feil et al. (2005) compared the genome sequences of Pseudomonas syringae pv. syringae B728a and P. syringae pv. tomato DC3000, two economically important pathovars species of plant pathogenic bacteria. Such comparison revealed diverse unique genes in strain B728a. For example, functions such as ectoine synthase, DNA repair, and antibiotic production, were discovered to be involved in the epiphytic fitness and stress tolerance (8). A genomic comparison of fluorescent genomes (strains SBW25, Pf0-1, Pf-5) (9) revealed a huge genomic heterogeneity among the three strains analyzed, and that the 42% of plant-inducible genes were not shared by all fluorescent strains, suggesting that ecological success requires specialized and core functions. In addition, the core genome and pangenome of twelve P. aeruginosa strains was reported (10), as well as the accessory genome of these species that ranged from 6.9-18.0% of the total genome, with most of these accessory genes found in mobile elements, and a majority of them with unknown or unclear function. P. fluorescens UM270 was isolated from the rhizosphere of Medicago spp. plants. The strain revealed different plant growth-promoting activities, in addition to great rhizosphere-colonizing and competence traits (11). A draft genome sequence was recently reported due to the interest in identifying the genetic determinants responsible for its plant benefiting capacities (12). This work presents a genomic analysis of the UM270 gene functions as compared to other available pseudomonad genomes, highlighting the genetic and functional differences between each strain of this group of fluorescent and plant growth-promoting bacteria. 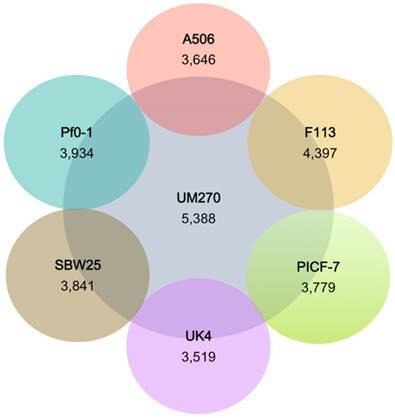 Comparison of eight Pseudomonas fluorescens genomes, including the strains A506 (2), Pf0-1, SBW25 (9), F113 (13), PICF7 (14), UK4 (15), as well as the UM270 strain, was carried out. Though Pseudomonas sp. UW4 has not been confirmed as a P. fluorescens species (16), it is still closely related to the fluorescent group, and was included in the analysis. Complete genome sequence traits are described for the eight strains analyzed here (Table 1). Original genome annotations were obtained directly from the NCBI nucleotide database. Genomic comparison were made using Mega 5 (17). Previous to the analysis, all homologous sequences were identified by comparing all the protein sequences using the Ublast algorithm, contained in USEARCH (18), against NCBI's non-redundant database (nr), with an e-value threshold of 1e-6. The SEED database was used to associate orthologous functions between the pseudomonad genomes. The core genome of eight P. fluorescens strains and Pseudomonas sp. UW4 was calculated by pairwise comparison using Reciprocal Best Hits (RBH) (19). Briefly, all eight strains were compared against each other using blastp with an e-value threshold of 1e-6, and then we searched for orthologs as RBH. All genes were combined into a single file and all genes conserved among the genomes were counted, and all “unique” genes were also counted for each genome. Here we refer to “unique” genes as those found in only one of the genomes analyzed, even if they might be present in some pseudomonad strains outside of this study. A literature search of the assigned functions in all genes found to be unique to the strain UM270 was performed. Genomic features of Pseudomonas strains analyzed in this work. A total of eight complete genomes of P. fluorescens (and Pseudomonas sp. UW4) were downloaded from GenBank and compared against the recently sequenced strain UM270 (12) (Table 1). All genomes consisted of a single circular chromosome, except for A506, which is the only genome containing a plasmid (2). In agreement with previous reports on Pseudomonas spp. (2), these genomes varied in genome size from 5.9-6.8Mb, and the number of CDSs ranged from 5,178 to 6,009. Most of the strains are plant-associated, and were isolated from rhizosphere, endosphere and phyllosphere, except for strain UK4, which was isolated from a biofilm, formed on a drinking water fountain (Table 1). There is no evidence that the latter strain has a plant-associated role, but was included as an out-group. A general comparison of genomic functions among Pseudomonas strains, shows similar abundance of genes involved in primary metabolism, such as pathways for amino acid synthesis, carbohydrate metabolism, proteins and DNA processing, were found. Virulence, disease and defense are common activities among these strains, similarly to metabolism of potassium, phosphorus, sulfur and iron (Supplementary Figure 1). Several functions vary among the members of this group of bacteria, such as metabolism of nitrogen, respiration, cell wall and capsule, stress response, secondary metabolite biosynthesis, regulation and cell signaling; this variation in gene functions could help us understand the ability of colonization and adaptability of these rhizosphere-colonizing bacteria. Interestingly, P. fluorescens F113 and UM270 displayed the major abundance of functions involved in motility and chemotaxis. A closer comparative analysis was performed for the presence/absence of functions involved in biocontrol and the interactions of P. fluorescens strains with plants and the environment. Biological control mechanisms include synthesis of secondary metabolites against bacterial and fungal pathogens, including toxins and bacteriocins. The UM270 genome contains biosynthetic genes for multiple secondary metabolites, such as 2,4-DAPG, phenazines and HCN; the rest of genomes contained only one or two of these functions. These secondary metabolites are probably responsible for UM270 being an efficient biological control agent. Unlike UM270, strains PICF-7 and Pf0-1 exhibited chitinase activity, an important trait for fungal cell wall degradation. The presence of biosynthetic genes for bacteriocins is common to all genomes, except for microcin in UM270. Siderophores are very important for a plant growth-promoting bacteria (PGPB), since they fulfill relevant activities in the rhizosphere to promote plant growth and control phytopathogens (20,21). PGPB can excrete high-affinity siderophores to chelate Fe[III] from bulk or rhizospheric soil and thereby making it available for the bacteria and plant cells; but at the same time, making it less available for the phytopathogens, thus preventing plant diseases (22). In this regard, pyoverdine is a common trait of the P. fluorescens strains, but several other siderophores were found in the strains analyzed here, such as achromobactin, enterobactin, pseudomonin, rhizobactin and piochelin. Communication between bacteria and the plant host involve important signaling molecules. Among these, phytohormones play a crucial role in such interaction. UM270 was the only strain possessing genes involved in the synthesis of indole-3-acetic acid (IAA), the most common auxin, and phenylacetic acid (PAA), also known for its antimicrobial activity (23). The IAA synthesis in UM270 strain by Hernández-León et al. (2015) has been previously detected (11). The presence of the acdS gene, encoding an 1-aminocyclopropane-1-carboxylic acid (ACC) deaminase was detected in all the genomes analyzed here, which highlights the relevant role of this enzyme in lowering the levels of ethylene, thus indirectly promoting plant growth (24). An important gene involved in the synthesis of the volatile organic compound 2,3-butanediol was found in strains UM270 and F113. This volatile has been associated with the induction of systemic resistance in Arabidopsis thaliana and tobacco plants. Importantly, bacterial mutants blocked in 2,3-butanediol (and acetoin production) were unable to promote plant growth (25,26). Genes involved in the biosynthesis of Quorum Sensing (QS) molecules were also searched, such as Acyl-homoserine lactone (AHL) and homologous genes to the luxI/R family. A gene coding for a LuxR solo was found in strain UM270, not so in the rest of the pseudomonads analyzed. The solos are homologous to QS LuxR-type molecules able to respond to endogenous AHL and binding to low molecular weight molecules synthetized by the plant other than AHLs (27), thereby expanding their regulatory repertoire. Although, we could only identify a homologue of this family in UM270, it is possible that the rest of genomes also contain some members of the family, but not yet identified. For example, a subfamily of LuxR solos, named PsoR, was recently identified in the plant-associated bacteria Pseudomonas protegens strains Pf5 and CHA0 (28). Hence, further research is needed for determining new QS molecules and their mechanisms. One common trait among these genomes was the presence of gene products involved in Quorum Quenching, such as AHL acylases and Homoserine dehydrogenases. The presence of members from the Secretion Systems types I, II, III, IV and VI was also observed, which suggests a high level of rhizospheric competence and intense metabolic activity in this group of bacteria. Of the genes that were found to exhibit variable patterns of presence and absence, those that encoded toxins were the most notable, including some Toxin-Antitoxin systems (TA), such as vapBC, higAB, relEK, relEB, hicAB and some unnamed TAs, widely reported among Proteobacteria, regulating normal physiological processes but also involved in pathogenicity of bacteria (29,30). Importantly, genes involved in the synthesis of insecticidal toxins were detected in UM270, F113, PICF-7 and UW4 (Data not shown). The eight P. fluorescens strains core genome was analyzed as a measure of genomic intra-species variation. 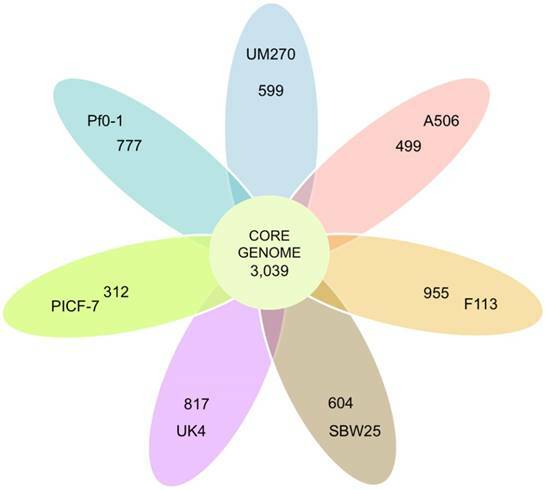 The core genome predicted contained 3,039 CDSs (Figure 1). This represents 56% of the predicted CDSs in UM270. The core genome covers from 51% to 58% of the SBW25 and A506 genomes, respectively. The data indicate high genomic variation in these fluorescent bacteria. By comparison, the related pan-genome of twelve Pseudomonas aeruginosa genomes contains a total of 5,316 core genes (10). However, distant species, such as Bacillus cereus, contained a smaller core genome (3,030 CDSs) shared between twelve analyzed genomes (31). The similarities between genomes with the UM270 strain were also analyzed. F113 shared more CDSs with UM270 (4,397), while UK4 was the most distantly related regarding the number of CDSs (3,519) (Figure 2). This result agrees with the different habitats and ecological roles of each strain, being F113 a rhizospheric bacterium with biocontrol activities (32), similar to UM270; while UK4 is a biofilm former with no attributed plant-associated activity (15). Venn diagram representing the core-genome of P. fluorescens. All shared and unique CDSs by the total of strains are presented in the circle. The ovals outside contain the number of CDSs that do not have homologs in any of the strains analyzed; that means unique predicted proteins. Number of predicted proteins shared between P. fluorescens complete genomes with the strain UM270. The inner circle shows the number of predicted proteins of UM270; whereas, external circles show the number of shared proteins with UM270. A total of 599 unique predicted CDSs in UM270 were identified. These protein-coding genes are not present in any of the rest of the pseudomonad strains surveyed in this study. From the total, 407 CDSs were of unknown function or encoded “hypothetical proteins.” All these CDSs require further experimental analysis to discover putative roles in plant-bacteria interaction. Perhaps general transposon mutagenesis would help us discover non-reported gene functions. After this, we focused our analysis in the 192 CDSs (out of 599 unique UM270 genes) where we were able to assign a putative function or gene role. Among these, flagellar protein-coding genes were the major group (17 CDSs), which include biosynthetic proteins (FlhABPQR), regulatory flagellar protein (FleQ), motor switch (FliN), and structural basal-body rod proteins (FlgCDFG). A total of 15 transporters (including 11 ABC-transporters) were found. Fourteen regulatory proteins were also identified, from which eight belonged to transcriptional regulators. Some other frequent functions include proteases, hydrolases, secretion, activators, reductases and biosynthetic proteins. From an extensive search of information about the unique proteins encoded in the genome of P. fluorescens UM270, a list of 17 genes (among many other) emerges form the genome comparison with the other strains, with activities that may be relevant in the rhizosphere, biocontrol and other plant-bacteria interactions. Among these genes, it is worth noting those involved in motility, secretion systems, sensorial activities and biofilm formation (See Table 2). Biofilm formation has been previously reported for the strain UM270, where its production might be playing an essential role in root attachment and rhizosphere colonization (11,33). Biofilm formation has also been reported to be relevant for root colonization and plant protection, where bacteria (B. subtilis 6051) are able to produce antibiotic compounds (such as surfactin) that protect plants against pathogenic microorganisms (34). Some candidate virulence factors present in UM270 genome were detected and found to perform the following putative functions: a 3-oxoacyl-[acyl-carrier-protein], catalase, capsule polysaccharide export, endoglucanase, cyclolysin secretion ATP-binding protein and diguanylate cyclase. In some species of the genus Pseudomonas these virulence factors are important for cell detoxification, resulting in host survival. Particularly, the presence of the O-antigen has been studied in gram-negative bacteria, mainly in P. aeruginosa as a potent virulence determinant, where it is highly immunogenic conferring a strong antibody response from the host (35). However, in a non-pathogenic bacterium such as P. fluorescens UM270, it would be interesting to assign a possible beneficial role during plant-bacteria interaction. Biological activities of unique CDSs predicted in the genome of P. fluorescens UM270. 3-oxoacyl-[acyl-carrier-protein] synthase, KASII Regulation of virulence factors. (GGDEF & EAL domains) with PAS/PAC sensor DGC involved in biofilm formation in P. fluorescens Pf0-1. A member of sensorial systems found in the UM270 genome includes halovibrin (hvnA), a histidine kinase two-component system (CheA) and sensory box regulators. Halovibrins (HvnA and HvnB) were identified in the symbiotic interaction between Vibrio fischeri and its host the squid Euprymna scolopes. HvnA and HvnB are secreted by V. fischeri and mediate symbiotic signaling during colonization of host tissues (36). On the other hand, histidine kinases allow bacteria, plants, and fungi to sense and respond to their environment, regulating a number of cellular responses such as osmoregulation, chemotaxis, sporulation and microbial pathogenesis (37). An homolog of the CheA histidine kinase of Thermotoga maritima (38) was also found in UM270. Phosphotransfer-mediated signaling pathways, involved in signal transduction, have been identified in Pseudomonas as the two-component GacS/GacA global regulatory system (39). All these genetic elements detected in UM270, but not in other analyzed strains here, unveil candidate genes for future analysis and potential roles for competence and colonization of the rhizosphere. If these candidate genes have essential roles during rhizosphere or root colonization, they might be helping UM270 strain to be well suited for other important roles, such as biocontrol of phytopathogens and direct plant growth-promotion, since all these multiple activities are linked together to benefit plant health (11, 21, 33) aiming to a best effort to employ such microorganism in crop protection and sustainable improvement. GS thanks CONACYT-México (Project Number: 169346) and CIC-UMSNH (2016-2017) for financial support. JEHS received a scholarship from CONACYT-México and from ELAP-Canada. GMH received support from the Natural Sciences and Engineering Research Council of Canada (NSERC). Computer support by The Shared Hierarchical Academic Research Computing Network (SHARCNet: http://www.sharcnet.ca/) was provided.